Gareth O’Callaghan, recently stepped back from broadcasting to concentrate on battling MSA, a virulent form of Parkinson’s disease. A host of special guests will celebrate Gareth’s remarkable radio career, from pirate days, to real high seas adventure with Radio Caroline, his 2FM days and his sojourns in the independent sector with Galway Bay FM and Classic Hits. 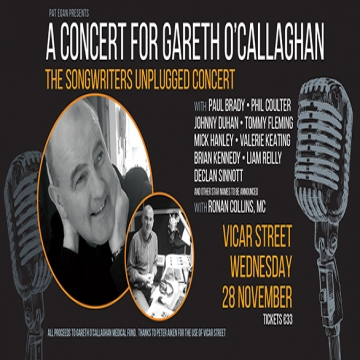 All proceeds to Gareth O’Callaghan Medical Fund.